The past two weeks of Spring flowering have been a feast for eyes. I am particularly drawn to the way WISTERIA adorns various buildings, homes, gardens and businesses. I have found a couple favorites, which I enjoy checking out each year. The first one is located at the corner of NE 56th St. and !st Ave NE. I't's an old-fashioned corner store-front building, which now holds a small hair salon. As if the wisteria wasn't enough, the parking strip is full of huge Oriental Poppies in classic orange. 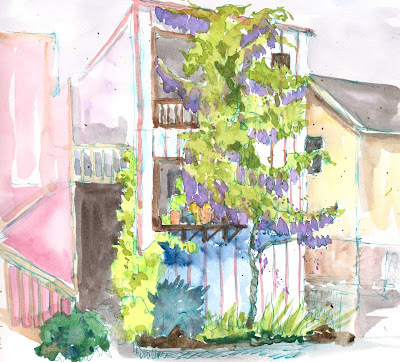 Another "perfect" quaint scene is located in the alley behind Immanuel Lutheran Church at 1215 Thomas St. in the South Lake Union (Cascade) neighborhood. 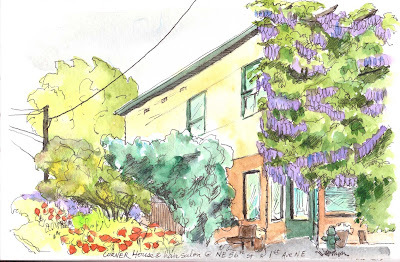 I attend that church, and I've often noted the cute little "house" on the alley, but when the wisteria came into bloom, and I saw it, I had to come back the very next day to sketch it! !